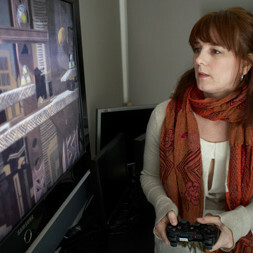 Katie Salen Tekinbas is a game designer, animator, and educator. She is a professor in the DePaul University College of Computing and Digital Media. She has taught at Parsons The New School for Design, the University of Texas at Austin, New York University, and the Rhode Island School of Design. She has an MFA in graphic design from the Rhode Island School of Design. Salen has received grants as principal investigator or co-principal investigator from the Bill & Melinda Gates Foundation, the MacArthur Foundation, the Carnegie Corporation, and Intel. She is one of the co-authors of Rules of Play, a textbook on game design, and co-editor of The Game Design Reader, a Rules of Play Anthology, as well as co-editor of The International Journal of Learning and Media. She is the former Director of Graduate Students for the Design and Technology Program at Parsons The New School for Design, as well as the former Director of the Center for Transformative Media, a research center focused on emerging trends in design and media. She is the Executive Director of Institute of Play, a non-profit learning design studio that bases its work on the principles of games and play. In 2009, she helped design and launch Quest to Learn (Q2L), a public school in Manhattan, New York City, and later participated in developing ChicagoQuest, a charter school in Chicago. Salen’s work has involved the development of slow games, online games, mobile games, and big games, both commercially and institutionally.